Shrewbury biscuits are the best biscuits ever. EVER. They are buttery, sweet and melt in your mouth. Once you've had a taste of these, you won't be able to stop at one. It has been ages since I enjoyed one of these biscuits. If you haven't heard of these, I don't really blame you. I haven't seen these at all in Australia. In India, if you are from Pune or the surrounding areas, Kayani's Bakery was where you'd get your fix of these. And if you were really lucky, a random store in Mumbai would stock them. But today, I come bearing good news, no, Great News. You can now make Shrewsbury biscuits at home with 4 basic pantry staples - butter, sugar, flour and vanilla extract. Yup, that's how simple it is. Now the trick to getting these biscuits right, is to bake them on a low temperature for a slightly longer period. But keep an eye on them. You want to take them out just when they start getting a little color on them maybe even a tiny bit earlier than I did this batch. The store bought Shrewsbury biscuits have a distinct look. They are stamped. These may not look like the store bought one, but they taste just like them, if not better. And I'm not just saying that, the store bought ones contain margarine and who knows what kind of stuff is in it. These are made using butter. And it is a well known fact that everything is better with butter. 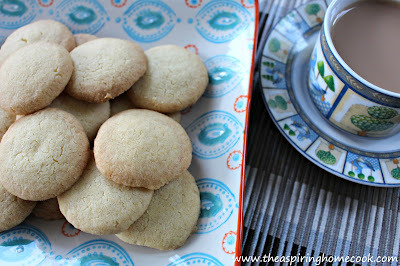 :) These biscuits are smaller than the store bought ones but they look daintier this way. Serve them up with a hot cup of tea when you're expecting company over and get ready to be the most popular biscuit maker around. Line a baking tray with some baking paper and lightly grease it and set aside. In a large bowl, whisk the butter and sugar till light and creamy. Add the flour and stir through. Gently knead till it just about forms a soft dough. Divide the dough into 24 portions. Roll them out into balls and flatten to a disc and place on the prepared baking tray. Bake for 30-40 minutes or till they are just starting to develop some color. Thx for the recipe ....is that maida? Or wheat flour? We will love your biscuits, they look awesome! Thanks so much for sharing your post with us at Full Plate Thursday. Have a great weekend and come back to see us real soon!